A nervous sense of humor greets travelers at the highest and most scenic road in the world. Hand-painted signs saying, “Relax, slide area ends” dot sections of the Karakoram Highway along the Hunza River in northern Pakistan. Landslides are commonplace here. But on January 4, 2010, a massive rockslide buried part of a village and blocked the river’s flow. Boulders, rocks, and debris tumbled down the mountainside that day, killing twenty people and damming the river until it swelled and swallowed more communities. In months, the plugged-up river would submerge eleven miles of the Karakoram Highway, turning a thriving region buzzing with trade from the Chinese border into scattered clumps of unconnected villages. When hydrologist Jeffrey Kargel of the University of Arizona saw news footage of the rockslide, he had a hunch the flooded river could swell into a lake. He asked geologist Gregory Leonard to check recent satellite images of the area. “Sure enough, there was a lake forming behind the rockslide dam,” said Leonard, Kargel’s colleague at the University of Arizona. “It’s always startling to see the first images of these kinds of things.” Something else worried Kargel. Three huge glaciers, including the thirty-five-mile long Batura Glacier, are perched on the mountains above the flooded villages. In spring, those glaciers would start gushing melt water down into the new lake. Kargel said, “If the rockslide dam overflowed and burst, more people downstream would be in harm’s way.” Kargel studies glaciers and the hazards for communities living near them. He had the tools to figure out when the new Lake Gojal would overflow. But he and Leonard had to do it fast, if the information was to be of any help. In many ways, the birth of Lake Gojal was not a surprise. The Hunza River, from which it spawned, sits deep in a mountain valley with extremely steep slopes. “Masses of loose glacial sediment mantle some of these slopes,” Kargel said. The loose gravel, steep slopes, and the water that starts trickling down every spring from the Batura, Pasu, and Ghulkin glaciers have made the region notoriously vulnerable to rockslides and floods. While geologists have found evidence of rockslides that date back to the 1800s, the January 2010 rockslide that thundered into Hunza and snuffed out Attabad village was larger than usual, and finally succeeded in completely cutting off the river. It also cut off the rest of the world. Locals struggled to escape the area, and rescue workers toiled to haul aid and supplies to the isolated villages. With efforts focused on emergency response and disaster preparedness, Kargel and Leonard searched for reports on the new lake in the media and from colleagues. In Arizona, the two researchers decided to make a virtual three-dimensional model of the blocked valley and the lake that was growing inside the valley to determine when water would overflow the dam. They had to figure out how much water was already in it, and how much more was expected to flow into it once the nearby glaciers started sending melt water in the spring. “It’s like creating a bathtub model of the shape of this valley and the dam itself,” Leonard said. To create the model, they relied on data extracted from the Advanced Spaceborne Thermal Emission and Reflection Radiometer (ASTER) Global Digital Elevation Model (GDEM). They also analyzed a sequence of satellite images taken by the ASTER and Advanced Land Imager (ALI) instruments. The satellite images revealed the lake’s growth and its submergence of the Karakoram Highway and several villages, and how the land around the area had changed before and after the rockslide. They now knew what the shape of the tub looked like; the next challenge was to gauge how much water was flowing into it. Kargel found a thirty-year record of the Hunza River’s rate of flow. “That data set was really crucial,” he said. With it, they could estimate how much water was flowing into the lake, and how the lake would evolve. To identify the sources of glacier melt water above the valley, they used images from the Global Land Ice Measurements from Space (GLIMS) project. But they still needed to confirm some of the river flow and satellite data with field observations. Geoscientist Jean Schneider was already at Lake Gojal, working as a consultant for Pakistan’s National Disaster Management Authority (NDMA). He described what kind of rocks and soil had tumbled from the mountainside, measured everything that he could, and sent photographs. “Internet access was difficult in the region, so it was hard to get data to and from Jeffrey in the field,” said Schneider, who had to send the data from his office at the University of Vienna. From mid-winter to late spring, disaster management crews had been carving out a spillway to ease the lake’s swelling, and evacuating communities. The growing lake had displaced more than a thousand people and destroyed homes, farms, and fruit orchards in the villages of Shishkat and Gulmit. As it turned out, the overflow began on May 29, and the spilling water soon grew to a torrent. To the researchers’ surprise, the dam held as the water spilled over. Kargel said, “Everybody concerned, with one exception, was expecting a catastrophe of one magnitude or another.” That exception was hydrologist Victor Baker, Kargel’s colleague at the University of Arizona. Baker was convinced that the dam would hold and that the new lake would remain a lake for many years. “He believed that the dam’s downstream length was long enough and massive enough to prevent a rapid outburst,” Kargel said. The energy from water spilling over would be dissipated as it traversed the almost mile-long dam and would keep villages downstream safe. The lake would drain slowly and carve out a natural spillway through gradual erosion. Meanwhile, the lake needs watching. Locals fear that Lake Gojal still holds a dangerous amount of water and have used hand tools to widen the spillway themselves. “The spillway has just not been able to bring the water level down considerably,” Muhammad said. Unusually warm weather could bring more water from the glaciers down to the lake. Kargel and his colleagues continue to distrust the dam. “The lake remains dangerous, in my opinion,” Kargel said. “We will keep a satellite’s eye view on the situation.” It may turn out to be a long vigil. “This lake could go at any time, or it could just last for centuries,” he said. This article was originally featured in the 2011 issue of Sensing Our Planet, a NASA publication. For more information, see references below. Jeffrey Kargel is a hydrologist and senior associate research scientist at the University of Arizona. He also serves as the coordinator for the Global Land Ice Measurements from Space (GLIMS) project. Kargel became interested in glaciers through his research on the Martian cryosphere and its geologic and climatic history. NASA supported his research. (Photograph courtesy J. Kargel). 1. The article is featured in the 2011 edition of NASA’s annual print publication Sensing Our Planet, produced at The National Snow and Ice Data Center (www.nscidc.org). The article arose from research that used data from NASA Earth Observing System Data and Information System (EOSDIS) data centers. 2. Kargel, J. S. and G. Leonard. 2010. 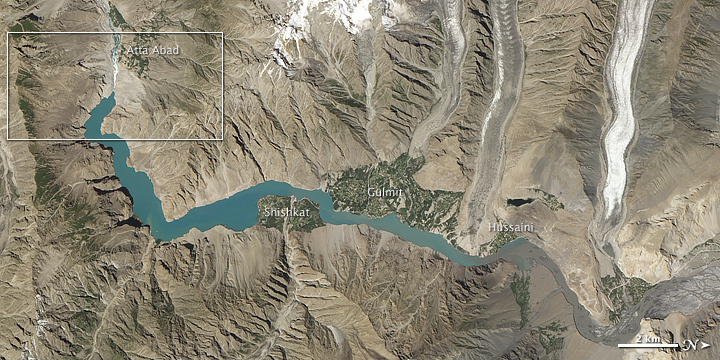 Satellite monitoring of Pakistan’s rockslide-dammed Lake Gojal. Eos, Transactions, American Geophysical Union 91 (43):394-395. Attabad Lake is Allah’s grace and gift to the new generation. I have appended copy of my comments that had appeared on Prof D. Petley’s blog. I would request you to bring it to the notice of Gen Nadeem HI(M) also. I will be happy to discuss the basis for my remarks if any clarifications are needed. You may also visit my blog by clicking on my name link below. It is high time for work to resume on the construction of Serena Hotel, located below Ghulkin village, towards the tail of this lethal, yet beautiful, water body. We need to capitalize on adversaries, by converting them into opportunities. The region’s economy remains crippled for two and a half yearS. This initiative will help create jobs and mobilize the economy a bit. Surely reading this one stands in awe at God’s majesty and power as the Qur’an commands those who suffer loss should say from God do we come and to Him is our return. The many Hunzais I know would have done just that. Truly enjoyed reading about the story of “real-time” scientific sleuthing and modeling by Drs. Kargel and Leonard at U of Arizona. I hadn’t been aware of their involvement. I had followed the updates and analyses recorded by Dr. Petley of the University of Durham (not Durham University). This was a disaster of mammoth proportions. Having spent some time and enjoyed the warm hospitality of the Hunzakuts in Gulmit, my heart goes out to the people of the region. Upper Hunza is nearly 100% Ismaili. As Amin Beg notes, the toll in terms of death, and loss of livelihood and homes has been immense and continues to mount. And the continued danger to people downstream is ever-present. If the dam were to rupture suddenly, a several-foot wave (if I recall correctly) will sweep downstream and possibly cause damage all the way to Gilgit. My thoughts and prayers go out to our brothers and sisters in Hunza. May this lake dissipate – and dissipate gently. Tremors and landslides are a way of life in this region – Karakoram, I was told, means “crumbling rock”. Still, this is a hardship. Every so often, large chunks of rocks slip off and crash on the Karakoram Highway, bringing with them tons of gravel. The very first image – a spectacular photograph – really says it all. The roads are blocked for days and the only way is to walk across the slippery debris. Hunzakuts, however, a hardy folk. They persevere, clear the roads and go on. I would like to see Simerg publish a story of how the Hunzakuts build a road from Gilgit to Karimabad for Hazar Imam. Even though I’ve travelled the Karakoram Hwy to Hunza, it was difficult to imagine how Lake Gojal could have formed. Thank you for this article because it clarifies so much. My heart goes out to the wonderful people of Hunza – the loss of lives and livelihood is quite heart wrenching. Fantastic article. Nature never ceases to amaze. But on the other hand, we have also to think about the people who were ‘misplaced’ by this event. I hope there were not many injured. Please see Amin Beg’s comment below. Thank you Simerg for sharing this. The Pakistan army’s subsidiary, FWO is busy blasting the spillway since the disaster took place in January 2010, trying to meet a target of lowering it down to 90 meters, so that the Karakoram Highway, 25-29 kilometers of which has submerged within the lake, surfaces up, and the vital link between Pakistan and China , and the upper Hunza-Gojal and central Hunza and Gilgit is restored. Recently the water level came down by 1.5 meter. The humanitarian costs are high, not withstanding the beauty of the lake and future touristic attraction. Over 19 people lost their lives, that included women and children. Over 25,000 people are trapped in upper Hunza, linked only through weather dependent boat service. 500 houses, in seven villages submerged in the lake with fertile agricultural land, orchards estimated cost 3.5 billion Pak rupees. The China border trade which was estimated 2.5 billion per year, was reduced to 15-20%. Cost of supplies and food items jumped by 200%. The internally displaced persons (IDPs) and the trapped population of 25,000 are fed through food aid from China for the last two years. Women, children, sick and the elderly suffer due to lack of health facilities and problems in transportation. Many people died because of lack of secondary and tertiary health services, women gave birth to children in boats while transporting down to Hunza. I would like to appreciate the efforts that Simerg has made to share this informative article. I have never been to my village since this catastrophe occurred last year, and I used to hear a lot of stories from various resources, but today I’m so glad to know the exact story that is very well presented through thoughtful written ideas and the mesmerizing images from space. It’s amazing to see geography in its making especially from so far; also the fact that predictions for the lake are coming from across the world, great work. Thank you Simerg for giving us the inside story. Simerg has done well to bring this information and imagery to its readers. Thank you Simerg for the knowledge you give everyone. Abdulsacoor in Portugal.